When someone left a box of free garden-grown vegetables in the plaza at Chautauqua, I couldn’t resist stashing a few in my bag. Grateful that a generous stranger shared the August bounty, I challenged myself to do more than slice the cucumbers into a salad. The Cucumber Sauté recipe in the Eating Healthy Cook Book (Better Homes and Gardens, 1986) came together quickly enough to avoid steaming up my kitchen – and gave me an unexpected way to use this member of the cucurbitaceae (also known as gourd) family. 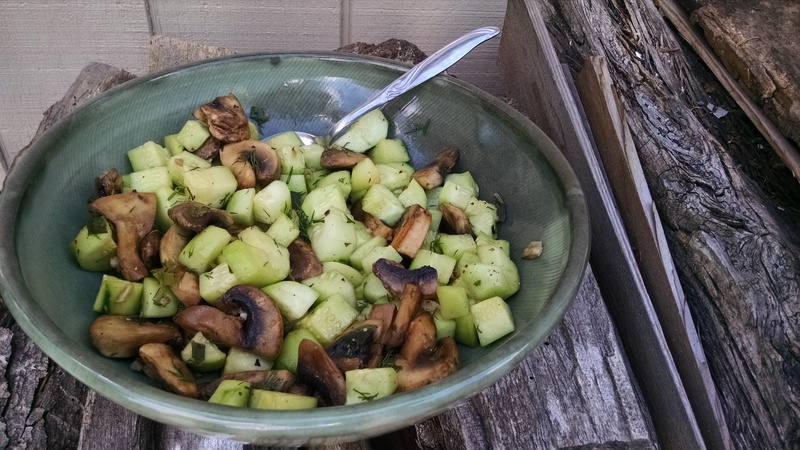 The cucumbers remained slightly crunchy and made a refreshing counterpoint to the mushrooms and onions. I let everything cool to room temperature before serving it as a side dish. The book’s concept of healthy eating reminded me of how much ideas about nutrition have evolved in 30 years. Back then, margarine, not olive oil, was the preferred fat for sautéing. Egg yolks were out; whipped dessert topping was in. Still, the advice to eat lots of fresh veggies is timeless. Good riddance to other trappings of the ’80s, especially big hair and parachute pants! In a 10-inch skillet, cook the mushrooms, onion and garlic in margarine or oil until tender [about 15 minutes]. Add the cucumber. Cook and stir about 5 minutes more or until the cucumbers are crisp-tender and the liquid is almost evaporated. Stir in the dill and serve. This entry was posted in cookbooks, Food, history and tagged 1980s, Better Homes and Gardens, Chautauqua, cucumber, dill, healthy, mushroom, saute. Bookmark the permalink.